Summary: In 1847, at the age of four, Sarah Roberts started at the Otis School in Boston, just a few blocks from her home. Soon, though, she was told by the police that she had to leave. The Otis was for white children, and Sarah was African American. The school she could attend was further from her house, had no place to play, and owned a single book. Sarah’s parents decided to fight the decision. They took their case to the Massachusetts Supreme Court, where it became the first case in the nation in which a white lawyer and an African American lawyer worked together, and the first in which an African American lawyer argued a case in a supreme court. They lost the case, but Sarah’s father didn’t give up. He traveled around the state to gain support, and in 1855, Massachusetts became the first state to outlaw school segregation. Goodman writes that the fight for justice is often like that, a few steps backward, then a few more forward. 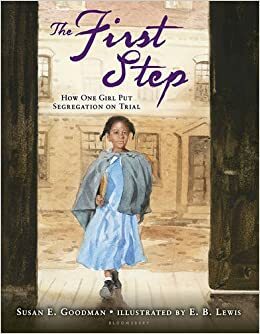 She concludes with the story of Linda Brown and how her experience with segregated schools, similar to Sarah Roberts’, led to the 1954 Supreme Court decision banning all segregated schools in the U.S. Back matter includes a timeline, a follow-up on some of the people in the story, resources, and how a nonfiction book is researched and written. 40 pages; grades 1-4. Pros: This little-known story is an important and inspirational part of American history. It’s told well, with beautiful illustrations. The last two pages do a fabulous job of outlining the work and research that go into the creation of a nonfiction book. Cons: The coloring in the illustrations sometimes make it difficult to differentiate skin tones. Maybe that was intentional, but I found it a little confusing. Looking forward to reading this one! Thanks, Janet!